Quite simply, the most influential living Western artist in China. A Czech-born Monaco resident, now in her seventies, Anna Chromy is the first Western artist invited to hold a solo exhibition in the National Museum of China on Beijing's Tiananmen Square. Staged in October 2015, Harmony: Canon & Contemporaneity was curated by three of the most influential figures on China's domestic art scene. The honour was simply the latest in a decade of Chinese plaudits for an artist who, following a life-threatening accident in 1992, turned her attentions largely to sculpture. Wan Siquian, the former Vice-Major of Beijing responsible for the construction of the Olympic Facilities and the National Grand Theatre, as well as it sculpture programme, “deeply regretted” only meeting Chromy after the 2008 sports fest. Otherwise he would have included her work, saying: “In all these years, I have not come across works as powerful and elegant as seen now in Anna’s exhibition in the National Museum of China. Ten years earlier and the City of Beijing would be full of her works”. 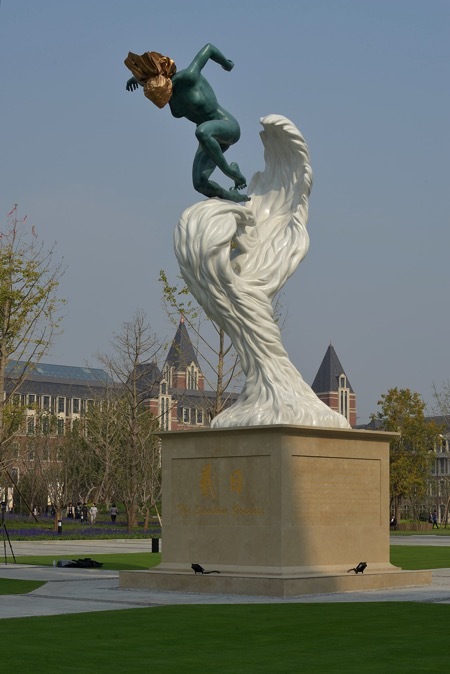 Wang Chunchen, of the China Central Academy of Fine Arts in Wangjing, Beijing, explains Chromy's particular appeal in a lengthy introduction to the exhibition catalogue, noting that while her works are inspired by European classical sculpture, they are not simply copies or re-imaginings, but "are endowed with new distinctive life elements by the artist". “After we deconstruct the relationship between form and object we fall into the void," writes Wang. Chromy's sculpture is what emerges on the other side, representing "a meaning of enlightenment to today's sculpture art in China". In short, what Wang appears to be saying is that Contemporary Chinese art and taste has, to an extent, lost its way and Chromy acts as a beacon to guide it back to the right path, both in terms of her focus on the myths and philosophies of our ancestors and in her mastery of contemporary techniques. According to Wang, Chromy has "walked through the fracture between modernism and classical sculpture to once again continue such an elegant graceful sculpture heritage". Wang believes that: "We have to encourage such spiritual enlightenment and care in the Chinese context of sculpture creation and practice, which is the root to and is necessary for rebuilding Chinese new culture and civilization." Chromy declares herself to be strongly influenced by Eastern cultures as well as the Western Classical tradition. Wu Weishan, Director of the National Art Museum of China, also writing in the exhibition catalogue, notes the importance of Lao-tzu and Confucius in her thinking and approach. She has found inspirations from them, says Wu, "which in her own words 'get energy on a particular aspect of conscience'." So much for the philosophy and approach. What about the facts of her success so far? To start with she has more public art permanently on show in China than any other living Western artist; 13 works in all. She first came to Chinese attention in July 2005, when two national Chinese TV networks, CCTV and Phoenix, covered her show of 24 monumental sculptures in the Place Vendôme in Paris. In December that year she was the guest of honour at the Guangzhou Art Fair. This led directly the Art Museum of Guangzhou – the third largest in China – acquiring two of her works, Sisyphus and Carmen, in 2006. A year later she took part in the Shanghai Art Fair, and in 2009 held a solo exhibition at the Beijing Clubhouse of the prestigious Hong Kong Jockey Club. In 2010, Chromy created the installation Galileo Galilei in the new Science City in Guangzhou, following this up two years later with another solo show, this time at the Art Museum of Foshan near Guangzhou. In the same year she was also inducted as an Honorary Fellow of the National Sculpture Association of China in Beijing by Wu Weishan, its director, and her work, Olympic Spirit, entered the collection of the Association's Museum. While participating in the 2013 Beijing Art Fair, Chromy was appointed as the only foreign judge in the National Sculpture Competition of China by the President of CCTV. Her star rose even further when the Sunshine Insurance Group, one of the largest companies in China, commissioned her to decorate their new Beijing headquarters with eight of her monumental sculptures, installing her 10m high Sunshine Goddess as the company symbol at the HQ's entrance gates, in 2015, and adding a fountain with the five musicians comprising her piece Music of the Rivers, as well as several other smaller versions of Sunshine Goddess for their regional offices. Phoenix TV have invited Chromy to be the guest of honour on their Ideas without Borders programme and have now moved the October exhibition to their telecast centre in Beijing for another three months' display, which they are actively promoting through their scheduling. Chromy also has more sculpture on public display in Europe than any other living artist – 60 works in all – and, astonishingly, has created the monumental icon Cloak of Conscience as a symbol not just of her existential philosophy, but also of the philanthropic awards scheme she and her husband Wolfgang run through the Conscience Institute. The largest sculpture ever carved from a single block of Carrarra marble – yes, at 250 tons even bigger than any Carrara marble block Michelangelo ever managed to get his hands on – the 5m high cloak took her four years to create, with the help of assistants, and is so large that you can even view it from its hollow insides. Carved in situ at Carrara, it will be installed permanently in a symbolic space before the end of 2016. Chromy’s dual pre-eminence in the West and East helped inspire the Ministry in charge of the China Pavilion at Expo 2015 in Milan to offer her another commission. This was to illustrate President Xi Jinping’s massive international infrastructure project under the motto "One Road, One Belt". The result was The Silk Road, a symbolic piece showing two towers engraved with scenes from the ancient silk routes, supporting a globe held by the hand of the East and the hand of the West, surmounted by the Angel of Peace, a tribute to the City of Xi'an (Eternal Peace), located at the beginning of the Silk Road. Wu Weishan and Wang Chunchen agree that the transcendent nature of Chromy's art is particularly appealing to Chinese taste, as is the way it resolves the differences between classical form and abstract modernism. They find her pieces both haunting and a focus for reflection, and in simple terms they appreciate the strength of her forms and the sheer artistry of her craftsmanship. Private commissions have followed the public displays and, while the art speaks for itself in appealing to Chinese taste, Chromy's understanding and interest in Eastern philosophy certainly adds to the mix, especially when it comes to explaining each piece. Perhaps the true secret of her success is that Chromy has avoided the trap of looking at the concept of art from a narrow Western perspective. She does not adopt the elitist attitudes that some members of the New York and London art world cognoscenti purvey in dismissing representational forms. Whether you like her art or not, Anna Chromy is undoubtedly a taste-maker par excellence. Whatever else buyers may want in future, these forms have proved that they will feature prominently on Chinese shopping lists. Visit www.annachromy.com for more information.